You may have heard me talk about Pinterest before. When I first posted about the “virtual pin board” back in February, I was sort of a newbie. Now, I’m a full-blown addict. And I’m not really ashamed. Enough about my addiction. What I want to talk about is how bloggers and businesses can use Pinterest to drive attention to their site. 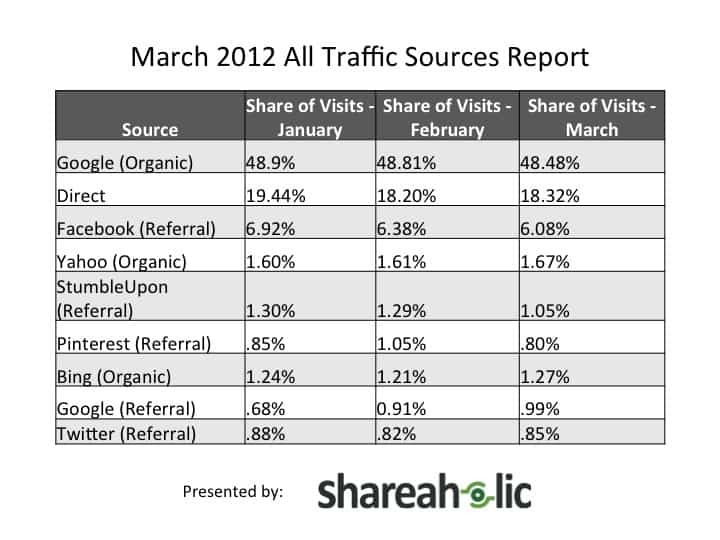 Shareaholic reported that Pinterest beat out Twitter in traffic referral in February. However, in March, Pinterest fell a few percentage points below Twitter. Either way, Pinterest is an emerging social media tool that will aid businesses and people. Take my boyfriend, for example. Pete is an aspiring marketer interested in social media. He blogs about music on his website Kind of Bleu (I’ve contributed as well). The blog gets an average of 100 visits per day, mostly due to social-media referral. His top referrer is Hype Machine, a website that compiles music blogs for the ease of people wanting to discover new music. Facebook and Twitter are also large referrers for Pete. He always looks for ways to promote his work. Along comes Pinterest. I’d been blabbing about it for a few months, so Pete decided to get an account. Can’t hurt, right? Turns out Pinterest is more than just repinning pretty things you like. Pete uses his account to upload photos and link them back to his site. Although he hasn’t got many referrals yet, Pete thinks his presence on Pinterest will be worth it. Not only will he continue adding to his account, but he hopes he will discover a new audience on the site. Pete also runs the Pinterest account for his local library, where he works. Whenever new material comes into the library, he promotes it on Pinterest with a photo of the book’s cover. He links the photo directly to library’s catalog system. He promotes library-sponsored events by posting their fliers and linking it back to their main website. For teen events, he links the photos to the teen site, powered by WordPress. There is a separate board just for staff recommendations. Pete posts the covers the books, asks his coworkers to write short reviews about the books and publishes them on Pinterest. Overall, Pete hopes to increase the interactivity of patrons with the library. By having a large online presence, he hopes to reach a bigger audience. In addition, he hope this online presence will encourage more people to visit the library. If more people visit the library, the easier it will be for the library to receive decent government funding. And with more money, the library will be able to better serve the community. Man, I talked a lot about my boyfriend. I just thought he was a good example of how an emerging social media tool can be used. At least I didn’t talk about how cute he is… now that would be embarrassing.